You can thread the cranks through now, as you do, thread the displacer rod connector onto the cranks. Don't worry if you widen the holes a little, we'll be adding extra bearings in the next step. When you're happy with the cranks moving the displacer, you can bend the displacer rod over a little more like a fish hook, to prevent the connecting rod from slipping off. Because aluminium is so soft, the bearing points will wear out quite quickly (mine lasted around 30mins!). To fix this, we'll add some steel bearings. 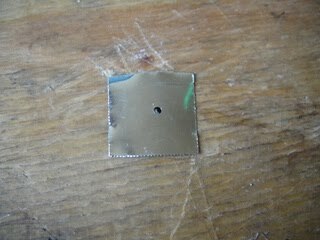 To make these, I drilled a 2mm hole in the side a flat side tin can then I cut a square around this. Make two of these. 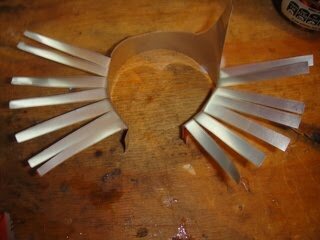 Then thread them onto the cranks and glue them in place using super glue. The curve of the tin can should almost match the curve on the coke can. 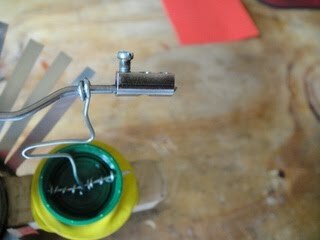 The diaphragm is a balloon with a bottle cap glued to it. The bottle cap has a piece of 1.2mm steel threaded through it. 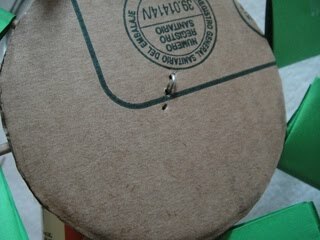 I made the holes for the steel wire using a drawing pin. To keep the diaphragm connecting rod in the centre, you'll need to make two spacers by wrapping steel wire around a piece of spoke. The spacers are around 1 cm long. Thread the diaphragm connecting rod through the steel pin with a spacer either side. Cut the neck off a balloon, and stretch the main part of the balloon over the end of a coke can. Then glue the bottle lid to the balloon using super glue. The balloon is fitted over the paste lid. It should be a little bit loose. You might need to use an elastic band to hold the balloon in place. You can connect the other end of the diaphragms push rod to the cranks now. You'll need to add another screw block to the end of the cranks to stop this coming off. Cut a coke can down to about 45mm tall, and push another coke can into it, this is just to widen the top of the can as it'll be weak once you cut the hole for the candle. Next cut a slot in the front of this can, about 50-60mm wide for the candle to fit in. 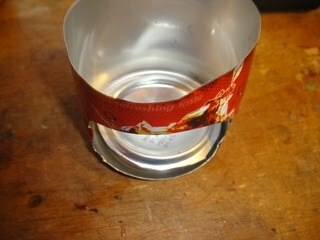 Use your pliers to flatten the bottom of the can, so that you can fit the bottom of another can in there upside down for the candle holder. Cut the bottom of a can right around the bottom edge. This is just to hold the candle. 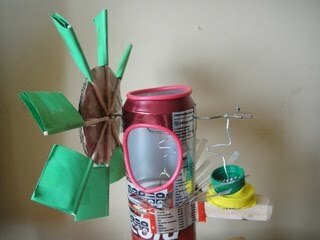 The fan is really easy to make. Essentially it's squares of paper glued onto BBQ skewers, which are epoxied to a cardboard disk. Start by cutting a cardboard disk out about 70mm diameter, before you cut it, mark 8 sections using a protractor or similar. Cut 8 lengths of BBQ skewers at around 10cm long. The paper is folded along it length, the folded again. Please look at the photo's, as it's hard to explain. Then it's cut along the previous fold and cut again in the middle. This should give you 8 little gift tag sized pieces of paper. 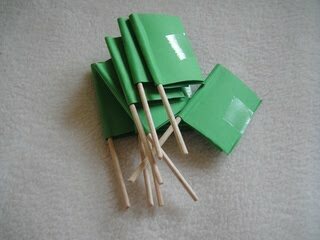 These are folded over the ends of the BBQ skewers, tape the loose ends over and glue the paper to the skewers. Tape each of the blades to the cardboard, along the 8 lines that you marked. 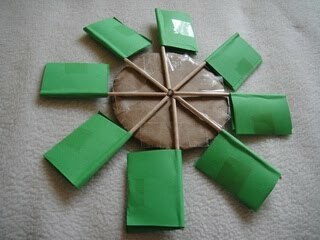 Raise your cardboard disk up about an inch using any random object, and epoxy the blades near the centre. Raising the cardboard makes all of the blades sit at the same angle. The fan is attached on the opposite side that the diaphragm connects to. Push the fan onto the shaft and bend a hook on the crank shaft. The hook is pressed into the cap so that the crankshaft can grip it. With the fan attached, tape on a 2p coin on the opposite side to where the displacer is connected. This is to counterbalance the displacer weight. Step 18: It's finished now! Hopefully, it'll work first time, unlike mine which needed some tweaking. You'll most likely have to adjust the diaphragm connecting rod until the engine turns smoothly. There's not much to wrong in this engine, other than too much friction, or air leaks. So if your engine doesn't work, check those things. The next few steps are additions you can add to make the engine better, such as a fan, heat sink and "super stylish" red trim. I made a simple heat sink out of a coke can, by cutting the top and bottom off. I cut fins down the sides of the can leaving out a space for the fan. It's glued to the wooden block using super glue. I added some trim to the edges of the cans in the same way as I did in my other Stirling engine instructable. 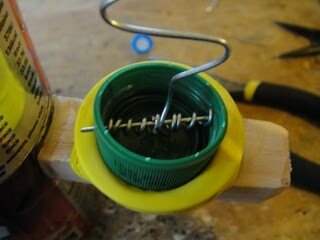 Take some electrical wire and cut it down the side, this can then be pushed and glued onto the edges of the engine.